The ANZAC Memorial bridge at Kaiparoro was designed by Alfred Falkner who first settled in Kaiparoro in 1889. The main road north from Masterton had always gone through Mauriceville but in 1905 Joseph Dawson constructed a suspension bridge over the upper Ruamahanga River at the foot of Mount Bruce and the western route became the more favoured. The Makakahi River was a problem for travellers at Kaiparoro though. Although not a difficult stream to ford in dry weather, when rain fell in the foothills of the Tararua Ranges, the river quickly filled and crossing the ford became dangerous. It was clear that a bridge was needed at the Kaiparoro ford, but getting one built turned out to be a time-consuming affair. 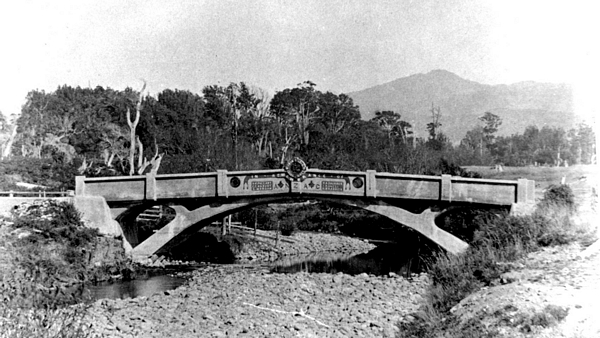 The Makakahi River at Kaiparoro was in the Mauriceville County, and although it was keen to see a bridge constructed, it had difficulty persuading the Government to help fund it. Alfred Falkner was the Mauriceville County’s engineer and he told them he could build it for £1000, and the Government agreed to contribute £500 on a one for one basis. Mauriceville County then assigned £250, Eketahuna County £200 and Eketahuna Borough £50. Falkner commenced work on the bridge in June 1921, when a wooden framework was built. Falkner kept a photographic record of the construction and it is possible to see the bridge slowly taking shape in his photographs. The bridge was completed and ready for opening in December 1922. Alfred Falkner had not only built the bridge but, by using local labour, he had managed to build it for only £800. A large crowd gathered at the bridge on 1 December 1922 to see it officially opened. Among those who spoke was MP George Sykes, who praised Falkner’s work and the support he had received from Miller. He also mentioned how pleased the Wairarapa Automobile Association was that their members could now motor over rather than through the Makakahi. Alfred Falkner died under sad circumstances in Jun 1939. The 84 year old settler had been missing from his home for some days and following an extensive search his body was found under a large rimu log where he had apparently sought shelter. His obituary mentioned his role as consulting engineer to the Mauriceville County and recorded his part in the construction of the “Bruce Memorial Bridge”, as well as others. Following World War Two three more names were added. The bridge, the last one-way bridge on road between Masterton and Eketahuna, was replaced by a more modern structure in the mid-1950s. Although calls were made for its destruction, its role as a unique ANZAC memorial ensured its survival.